These little bells were also at the Dollar Tree again this year~they were in the ornament section, and I think they come 9 in a box? I know I should take a picture of what they look like at the store and what section they are in, but you're just going to have to bear with my pregnancy brain and find them. I liked the brushed silver ones because they remind me of the bell from the Polar Express. They are great fillers! 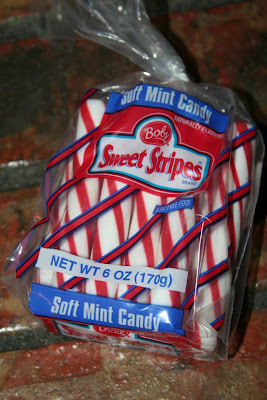 Another sweet treat I have found this year are these Bob's Sweet Stripes. Have you tried these? Ok, now I need your help. This baby boy is going to be here by the end of the year! Yikes, I'm getting a little nervous. I am having the hardest time with a name this time. With my others, I had a name decided from the beginning, but I am in a terrible rut with this one. There are lots of names I like, but nothing that has jumped out at me as "the one." So, will you tell me your favorite boy names? Even if you don't have kids, tell me the best ones you've heard. If you do have boys, tell me what you named them! Maybe it will inspire me. I would love to hear~I really, really do not want to go to the hospital without a name! Thank you so much and have a wonderful weekend! I have 3 boys. Colby who is 6 is my oldest. Mason who is 3 and Gage is my baby at 7 months. My husband wanted Gage with all 3 of them but I won with the first two. 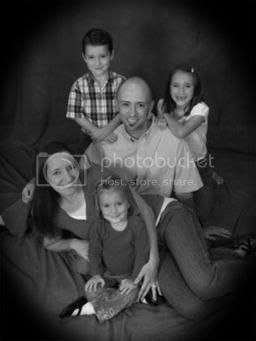 My husband then made me promise him with our baby that he could have Gage since this would be our last. I didn't like the name at all at first but it has grown on me and it defintely fits the little guy. Good luck picking a name I can't wait to find out what you name him. P.S. I also love the names Bennett and Trey. My little boy is Aaron, my nephew is Kaleb. We have Carter, Riken, Nicholas, Walker and Landon at Daycare. I LOVE those peppermint sticks. My great-great Aunt bought those every year at Christmas and my grandmother used those with her peppermint candycane cookies. Thanks for reminding me. My brother has put me in charge of making my grandmothers Christmas cookies this year. I love Newland but my hubby hates it. Mason is one I like also. Adam is another I love. Good luck! We are having a girl in a few days and we have been throwing around two names but I think finally we are going to go with Phoebe! But we will see! We used Spencer (1st name) Thomas(middle name)for our little guy (after Thomas Spencer Monson). Every time he hears the name at church or in conference the little guy just lights up- pretty fun. I like classic names, hence my boys' names: Matthew Christian, Samuel David, Ethan Cole, and Alexander Lewis (Lewis is my maiden name). I also like Gabriel and Benjamin. Just my two cents! Have fun...I love picking out names! My little boy's name is Mason. I also love Tanner, Cooper, Carson, Easton. My son's name is Trent. I love his name! Also, I heard of another boy name recently that I loved. This name is Ryland. I will have to check out those soft peppermint sticks at Walmart. And the bells from the dollar store. Thanks for all of your great ideas! Hi there! I love your blog by the way! And those bells are SO CUTE! Crew (my fav), Max, Jack, Keven, Wyatt, Jerrel, Gavin, & Toren. We went with G names. Our boys are Grant, Gavin, and Garrison. Love all of your ideas! You definitely have a talent! My friend, Heidi, sent me your blog. We have 2 boys and I have had a tough time with boys names. Ours are Jackson Henry and Miller Allen. We had a few discussions about it, but I LOVED Owen and I lost on that one. Best of luck to you! I just found your blog and LOVE it! I need to head over to Dollar Tree. My son's name is Spencer. Some boy names I love are Gavin, Owen, Jackson, Nathan, and Cole. My little guys are William Timothy (5), Benjamin Joel (3) and Samuel Rees (7 weeks). I also like Andrew, Stephen, Peter. I don't have kids yet but some boy names that I like are Leland, Layne, Carter, and Jackson or Jaxson. 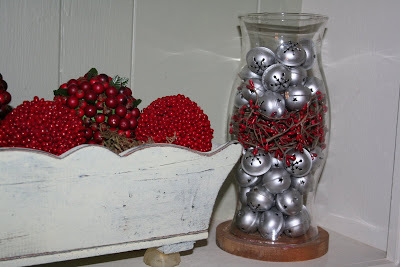 I used some of those jingle bells in my decorating this year. 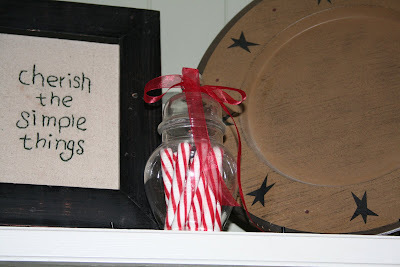 And those are the peppermint sticks that I bough and put in a jar as well. My husband ate one today and I heard this giant "EEEWWW" from the other room. Here he thought they had gone bad bc they were soft. After I explained that they were just a softer candy cane, he ate two more! He better like them bc I bought a bag for his stocking! How exciting that a new little baby will be in your arms by the end of the year! Some boys names I like are Andrew, Benjamin, Kyle, and Jesse. If you are looking for some more offbeat names :o) my FIL is named Kelley, my friend is named Dewey and we are hoping to one day have a little boy named Colt. Can't wait to hear what you end up choosing! Other names we considered were Eric, Landon, Jackson, Philip, Gideon, Andrew, Owen, Isaac, and Jonas. Good luck with the name, and thanks for the sweet and simple holiday tips. PS -- wandered over from the garland party earlier this week, and was impressed by your blog. Hope you don't mind if I look around a bit! If we had another boy, (which we're not, by the way--we're done!) I would love the name Sam. I also kinda like Max, Thomas. OUrs are Caleb and Joshua, as you know, from the Old Testament. Do you or Hyrum have a family name on your pedigree charts that you like? Good luck! hope you're feeling okay! I also like Jackson (if we ever have another boy that will probably be the name) and I also like Daniel. That is Parker's middle name and was almost his first name. Good Luck! Boy names are so hard! Those bells are the cutest!!!! I think I'm quite partial to the name Caleb. I just thought I'd throw my names in the ring My son is Derek Christopher he's our only but in our family we have William, Owen Collin, Brigham, Cole, Carson Brice,Seth, Nathan Thomas and Jaxon Hope this helps I'm sure you will come up with a wondrful name that just fits perfect Good Luck! I love all you decorating ideas. Thanks so much! My nephew's name is Crandall (his mom's maiden name) and I love it. I have three girls and we so ready to name a boy. I love the names Brigg, Davis, and Miles. Good Luck! Awww...I was due on the 27th but he came three weeks early! Congrats on your Christmas baby. Our boy is Ethan. I love Gabriel too, but hubby nixed that. I LOVE Gabe. David is also a favorite, as well as James. Those candy canes look yummy! I'm trying to avoid Walmart these days, but if I'm forced to enter their doors, I'll look for those candies. My son is named Joshua Paul, but I really wanted to name him Tyler. He was born on my husband's birthday, so I let him pick the name. Nice birthday present, right? Just wanted to say I love your blog and all your super cute ideas! I have one of those pregnancy brains too ..lol I am due in March with our 2nd BOY. My oldest is 8 and his name is Austin and our new little guy will be Preston Reid or Preston Shane , we cant quite agree on the middle name yet! Good luck on the names...I think boys names are hard! Love your blog! I think you have been given lots of ideas, but I'll throw in a few too just for fun. I like Dylan, Landon, Kayden, Carter, and Brenner ( I hadn't heard that one before, but we have a little boy in our ward named that and I think it is really cute ). 1- ilove your blog and all the energy you have to do all the great things you do. i have 3 boys, joshua darral, jeremy ryan, and jacob matthew. they are 21,16, and 4. yes i said 4. my 2 girls(who ever has the first boy) have stated they are going to name their boys chandler which will be there maiden name. good luck with the name. I have 2 boys-Kaison, pronounced like Mason and Kade. I never find all the cute things others seem to find at Dollar Tree. Maybe our local one is just not a good one? When I was in second grade (this was a long, long time ago! ), my friends and I sat on the playground and planned our lives. I wanted 4 things in my life--I got 3 of them! I planned to name one of my boys Mark Andrew. I never had a son, so the name went unused. Over the years, whenever anyone talks about baby names, I offer my favorite name. So far, no one has taken it--not my friends, kids, or grandkids. I just found your blog on a link from Just a Girl, and I'm really enjoying reading it. It's nice to meet you. My little own just had his first birthday on the 9th and we couldn't decide on a boy's name either. He was nameless for nearly 10 hours. We had narrowed it down to three: Jackson Keane (my husband's first choice), London Tate, and Cole Aryn (my first choice). We were both set on Jackson until a couple weeks before he was born. Everywhere I went there was a little boy under the age of 2 named Jackson. I wasn't comfortable with how popular it was. I remember all of the Michaels and Jennifers from my childhood who longed for a name that was more unique. So, London Tate it is!! :) I LOVE IT!!! I had a boys name picked out from the beginning, Daniel Patrick, but as luck would have it I had the girl I was hoping for. I named her Lauren Whitney. I love the name Flynn and I would use a family name as middle name, perhaps your maiden name. Just thought I would share. Love your blog. Boy you have lots of comments already...Kai (rhymnes with eye)and Carter are my boys...some names I think are fun Kade, Aiden, Lincoln, Hudson, Ashton, Preston, Tanner, Riggs, Tucker, Brannigan, Gavin. I agree with a previous post to not use a common name that everyone uses. Choose something unique and different unless it is a family name. I like Palmer, Preston, Reid, Crosby, Ashton, Slade, Elton, Sully, Gavin, Renae, Noah, Reese, Wesley, Whitman, Zachery & my son's name Coley Walker. Good Luck! Hope this gives you a few ideas. BTW love your blog and all your clever ideas. We have three boys, but my favorite name of the three (don't tell them!) is Brock. Anyway, we always had a hard time with boy names too, luckily we had 2 girls. #2 would have been an Eric, had she been a boy. You got lots of good suggestions here! Can't wait to here what you decide, and to see the little guy!! We don't have childred yet, but the names I like are Ian Edward, Sy Martin (this was going to be my name if I was a boy) Levi Allan and Holden Tate. Good Luck, you have a lot of comments and ideas. Hopefully one of them inspires you, like you inspire all of us, with your craftiness. Where did you get your red balls next to them by the way?? SO adorable. I've got two girls. And it's a good thing because I am TERRIBLE at picking out boy names. I really love the name Gabriel though. We might still use it if we ever have a boy. Good luck!! ve been looking for some like that for a school class handout! Thanks! My favorite names are ones that are "normal" but slightly uncommon. My sons are Gregory John and Graham Daniel- neither of which are used that often anymore. I love that they are not hard to spell, people don't ask me to repeat, yet they are the only ones in their classes (maybe school?) with those names! Another name I heard lately and loved was Easton. So cute. Good luck! Lane, Harrison, Wyatt, Luke. Those are some of my favorite. Good luck with the new addition. What a Christmas present for you. Hi...I too enjoy reading your blog! You always have the best bargains posted! My son's name is Brady Grayson and I love the name Owen. Best wishes for a fast and easy delivery! My son is named Dayton. It is a trendy name right now, but my Dad and my Grandfather are Dayton too. I love it! My boys are Josiah, Sam and Caleb. 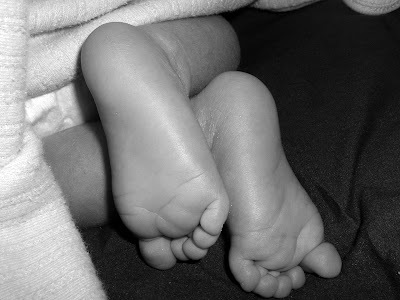 Other boys names I loved (but husband, obviously, didn't!) are Gideon, Tate, Max and Owen. It's A Wonderful Life is my FAVORITE movie-my cat is even named ZuZu-and when I found your blog I was instantly impressed! Kicked myself for not thinking of that name-320 Sycamore!? Perfect! Oh and Bobs Sweet Stripes? The best. My son's name is Daxter Taj, we call him Dax. We also love Thatcher, Rocco, & Jagger. r my picks. Good luck and prayers that all goes well 4 u! My son's name is Micah Joseph. He was a December baby, too. It would be appropriate for this time of year. Well let me add my 2 cents to the 1000 that are already here. I have been thinking about my sweet nephew to be and I like classic names---Daniel, Benjamin, Thomas, Gabe (I liked it for the Gabriel idea if it is Christmas baby) David, Samuel, Matthew, Jacob---ALL of these name (except Gabe) I LOVE and would have considered had they not ALL been used by my family. We are praying for you!! My family has Patrick Ryan, Collin McKay, Jacob Connor (Jake), Dillan Clay, and Cooper Ray. I like the previous post suggetion of Gabriel, or Gabe. If I had another boy it would be Wyatt!!!! Good luck! Kallin, Hunter, Blake, Ben, Ridge, Ty, Porter, Brody, Jared, Jayson, Shane, Brady Oliver, Caleb, Weston, Keegan, Sean, Dana, Ryan, Christian, Dusty, Hayden, Creed and Eddie! Love all your decor ideas! and i love those bells at the dollar tree!